Apple Tree Orchard Preschool & Childcare have some great opportunities for you. Child care jobs need people who are passionate and love working with kids. We want caring individuals who enjoy encouraging joyful learning in the classroom. If that sounds like you, then one of the child care careers at our preschool in Papillion, Nebraska might be perfect for you! Apple Tree Orchard Preschool & Childcare is a child care center dedicated to providing an enriching environment at every stage of development to the children in our care. Every day we strive to provide the best daycare experience possible. Our child care educators provide a structured environment that is full of attention and affection for every single child. Our goal for your children is to spend each day with the chance to learn, play and explore the world around them. Just like you, we want the best for your child. If you are considering applying for a position at a child care agency, contact Apple Tree Orchard Preschool & Childcare. Our child care center cares for children ranging in age from 6 weeks to 4 years and older. 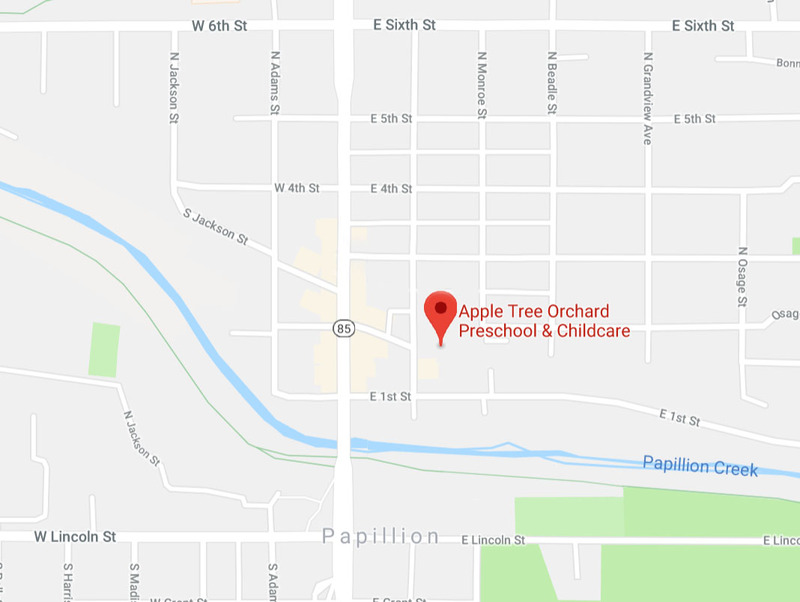 Apple Tree Orchard Preschool and Childcare is always looking for people that are passionate about teaching young minds. To find out what day care and child care jobs are available, please fill out the form below! At Apple Tree Orchard, we encourage your child's creative, playful, social, and imaginative sides through attention and affection in a structured environment. Apple Tree Orchard is a single site preschool and childcare that was established in 2000. Our daycare and preschool is family owned and operated. © 2019 Apple Tree Orchard Preschool and Childcare. All Rights Reserved.